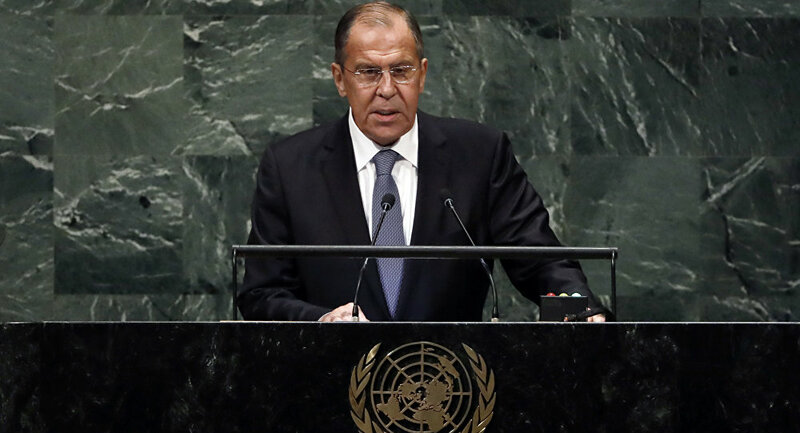 Russian Foreign Minister Sergei Lavrov has addressed the 73rd session of the UN General Assembly in New York City. Addressing the UN on Friday, the Russian foreign minister criticized what he called "unilateral approaches" by some countries to a variety of complex global problems, ranging from the Middle East peace process to the Iran nuclear deal, commitments to the World Trade Organization, agreements on climate change, and more. Defending the UN and other multilateral organizations, Lavrov warned of a "desire of some Western states to retain their self-proclaimed status as world leaders and to slow down the irreversible, objective process of establishing multipolarity. These powers do not hesitate to use any methods, including political blackmail, economic pressure and brute force," he said. Turning to the Syrian conflict, the senior Russian diplomat warned that Syrian terrorists and their patrons may attempt new provocations using chemical weapons, adding that Russia would consider such efforts this "unacceptable." "We warn terrorists and their sponsors that new provocations involving chemical weapons are unacceptable," Lavrov declared. 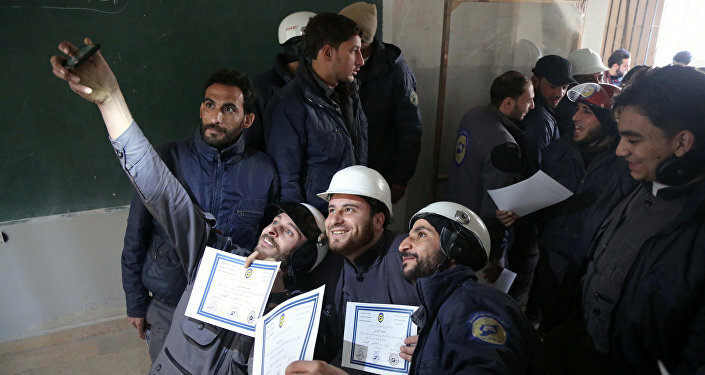 Commenting on the prospects for Syrian settlement, Larvov emphasized that the rebuilding of the war-torn country's infrastructure, and the return of refugees, must become the top priorities of international efforts, including at the UN, and must be implemented without any "double standards." Turning to the Israeli-Palestinian issue, the foreign minister cautioned against a one-sided approach to the problem demonstrated by some powers. "Despite the complexity of the situation in Syria, Iraq, Yemen, and Libya, we must not lose sight of the age-old Palestinian problem. A fair solution is crucial if we want the entire Middle East to recover. I want to warn against a one-sided approach and attempts to monopolize the peace process," Lavrov said. "We will make every effort, including in the within the Middle East Quartet, the Arab League and the Organization of Islamic Cooperation. Mutually acceptable initiatives must lay the groundwork for a peaceful and secure co-existence of the two nations, Israel and Palestine," the diplomat said. Moving on to the Iran nuclear deal, Lavrov emphasized that Moscow remains committed to preserving the landmark 2015 agreement despite the recent US withdrawal. Washington's move is a violation of UN resolutions and a threat to stability in the Middle East, according to the diplomat. Tehran, Lavrov said, is in full compliance with its obligations under the deal, and Russia will do everything in its power to support it. Focusing on conflicts affecting Europe, Lavrov lashed out against Kiev over what he said were its illusions about sending a Western-backed occupation force to the breakaway regions in eastern Ukraine, and urged the country's Western patrons to talk sense into Kiev. "Those sponsoring the authorities in Kiev must bring their proteges back to their senses, push them to end the blockade of the Donbass and to stop discriminating against national minorities across Ukraine," he stressed. Moscow, Lavrov noted, supports the Organization for Security and Cooperation in Europe mission in Ukraine, and is open to the idea of UN forces' protection for the OSCE mission. Commenting on Serbia and the Kosovo issue, Russia's top diplomat urged Pristina to hold dialogue with Belgrade, and vowed that Russia would support any resolutions acceptable to Belgrade at the UN. At the moment, he lamented, "Kosovo armed forces are being created. Agreements reached by Belgrade and Pristina with EU mediation are violated" in place of much-needed dialogue. Slamming Kosovo's US patrons, Lavrov pointed out that the US had illegally transformed "the UN-approved military presence in Kosovo into an American base," and accused NATO powers of opening "another rift" in Europe by working to drag Balkan countries into the alliance. Praising the ongoing warming of relations between North and South Korea, Lavrov stressed that this process must be rewarded with concrete UN Security Council support for joint projects between Seoul and Pyongyang. In any case, the process, he noted with satisfaction, "follows the guidelines of the Russian-Chinese roadmap" to peace for the peninsula. Russia will continue to promote the idea of dynamic economic cooperation and integration between Europe and Asia, previously defined by Russia as the 'Greater Eurasian Partnership.' The project is open to all European and Asian countries, whether or not they are members of various integration projects, Lavrov said. In addition to its economic prospects, the project has the potential "to become the foundation for an updated continental security architecture which meets the realities of the 21st century," the diplomat emphasized. Lavrov called on the international community to come together to create an international convention aimed at combating cybercrime and establishing globally-acceptable rules on behavior in cyberspace, pointing out that Russia first initiated a discussion in the issue of global information security two decades ago. Russia plans to submit a draft resolution to the General Assembly on the issue, the diplomat noted. "Against the backdrop of recent events, the development of global rules of responsible behavior of states in the information space, including the principles of the non-use of force, non-interference in internal affairs, and respect for state sovereignty are becoming ever-more urgent under the auspecies of the UN," he said.